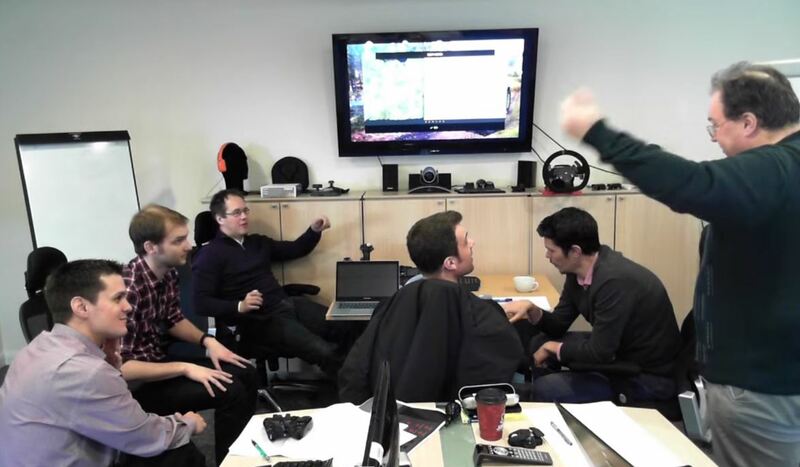 This is part 1 of a two-part post covering the behind-the-scenes design meetings for the Saitek Farming Simulator Hardware. 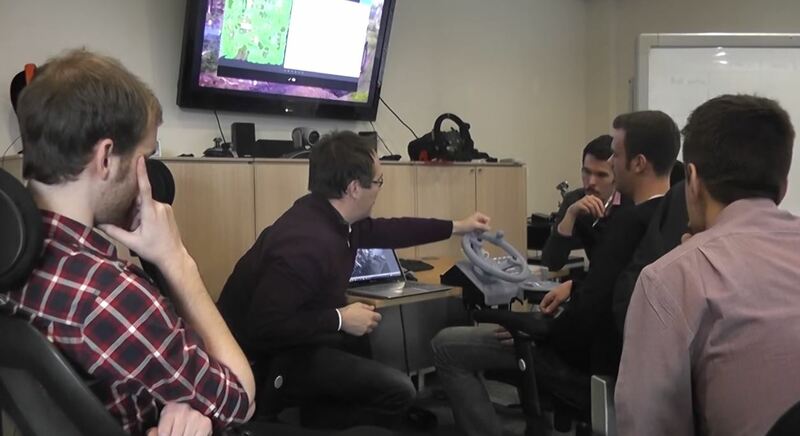 Saitek/Mad Catz were happy to welcome two of the senior developers from GIANTS Software, Manuel and Emil, to our Product Development studio in Magor, Wales to kick off the Farming Simulator Hardware Project. The three primary divisions of our NPD team were represented, covering Software, Industrial and Mechanical Design and of course, the Aesthetic Design team. After a brief introduction of everyone’s roles and responsibilities, we kicked off the debate. 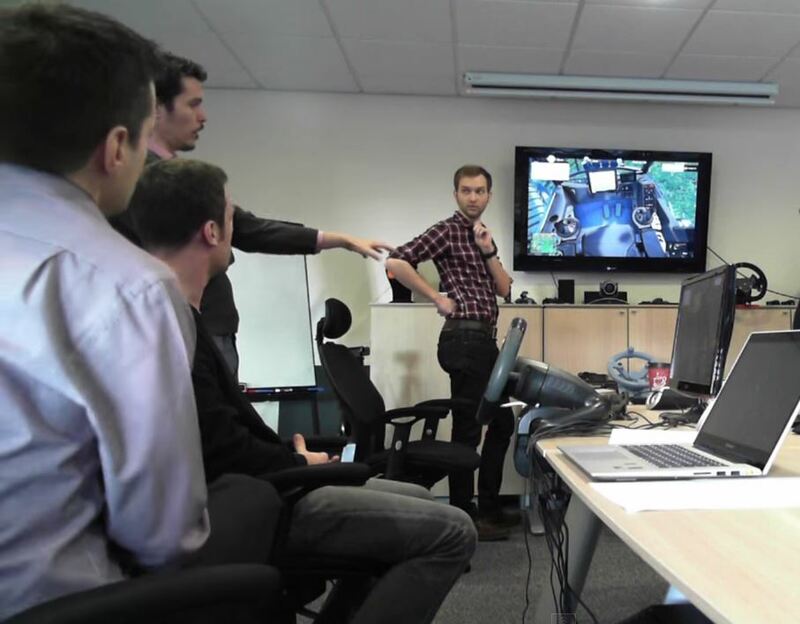 The first session was spent with the GIANTS team walking us through all the essential features of FS15: the different tractors involved and the different types of play, whether it’s ploughing, logging or harvesting and the types of control that would be ideal for each of these key applications. The prototype had been developed with a 900 degree rotation on the main wheel, analogue thumb sticks as the main buttons on the wheel, as well as a rotating wheel and separate joystick built into the side panel. The limitations of the HID protocol mean that only so many analogue axis are able to be recognized from a single device, so the selection of what is needed to be analogue (rather than a simple on/off digital toggle) needed to be firmed up. Steering of the tractor, pedals, the two thumb-sticks, the separate joystick, and cruise control had been assumed to be needed. 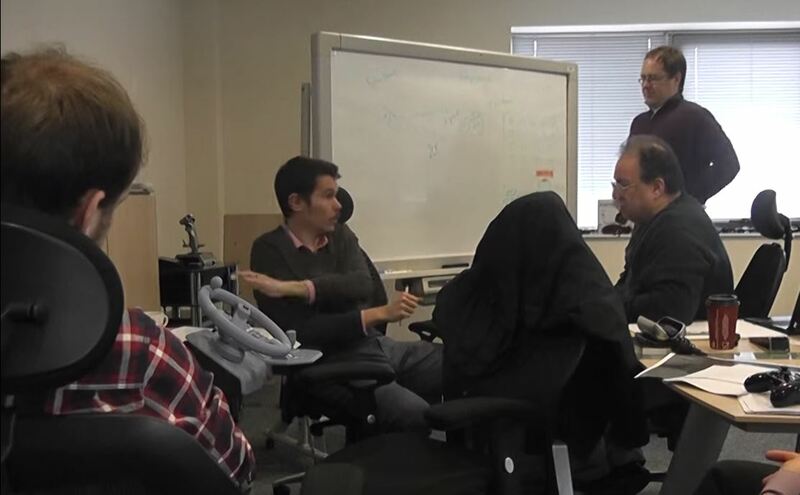 After some heated debate, the team decided that cruise control would be better implemented with a + and – button working in increments. Also hotly debated was whether to make the main joystick analogue and how useful this would be, for example, with logging in FS15. Six axes would be needed to move the arm of the logger crane which pretty much dictated that the lower right stick needed to be fully analogue. Ultimately, the solution that all agreed upon is to have the left thumbstick as a full 2-axis analogue controller, the joystick as a full 3 axis analogue controller and the right thumbstick (on the wheel) to be changed to a standard gaming d-pad. PRE-ORDER FARMING SIMULATOR HARDWARE NOW!